In my previous post Are You Ready To Become Relational, I talked about the need to move beyond the semantical definition of a business relationship to a state of relational readiness. Specifically, positioning your organization to look outside of the narrowly defined and largely ineffective performance-based contracting model, to an adaptive relational framework that is focused on improving outcomes. A critical element of this transition begins with the recognition that both objectives and stakeholder capabilities can and frequently do change from the point of initial engagement. Recognizing the inevitability of change in complex business relationships is the first step. Next, you must create a framework for managing these changes within the context of both existing as well as new relationships. This is the point of relational readiness towards which organizations must work. In doing so, there are three distinct areas of focus. Today we will discuss the first; defining the high performance business relationship. A general understanding of the relationship-based model from the standpoint of not only its differences from transactional or performance-based models, but the benefits that can be derived from it in terms of improved outcomes. This includes an understanding of the needed organizational structure, process and behavioural changes associated with being a participant in high performing relationship. First let’s get the myth out of the “relational” terminology. Relational contract theory has been around for a long time. It simply means that the whole agreement is not necessarily within the four corners of the contract. Almost all complex contracts contain this type of provision giving the ability to do amendments via a prescribed change order process. In this sense everyone’s model is relational. So on one extreme you have models that promote spending tremendous amounts of energy to define some sort of an end state, create work statements and metrics that presumably would achieve that end state, then source a vendor that can deliver that state. I often refer to those as transaction oriented performance based models. Now those deals also contain relationships and have relationship management frameworks . However, the relationship management function exist mostly to materialize the deal based on an initial set of assumptions and parameters. In other words, the relationship management function is really no more than another approach to enforce compliance so as to achieve a predetermined state. Procurement is easy in this type of model. Vendor selection is based on technical capability and capacity to deliver a known end state (product or service) and a fixed definition of value (financial or otherwise) as perceived at the time of the transaction. Needless to say, this approach usually falls short in terms of meeting stakeholder expectations. We have already seen the consequences of these types of arrangements, particularly when they span decades. The greatest challenge is that no amount of time and expertise expended by executives, lawyers, financial modellers, program managers or procurement people can create certainty over the long life of a contract. A relationship-based model lies exactly on the other side of this spectrum. In this model, the relationship is embodied in what we call the SRS Relationship Charter. The Charter, which provides the operational framework for a joint organizational entity, is centered around a clearly defined mission that includes the relationship’s purpose, values, supporting processes, and people. It is through this integrated joint entity that the generation of deliverables, the development and continuous alignment of the relationship’s strategic plan, product/service delivery and performance is managed. It is important to note that when I refer to delivery and performance management, I am not talking about vendor performance, but relationship performance. This is an important distinction because while the word relationship is frequently bandied about, it is usually within the context of a traditional performance-based contract. With the relationship-based model, the process for selecting a strategic partner or partners is different. It is based on what I call a strategic fit assessment and financial pricing model. Of course the pricing model to which I am referring is different from that with which most are likely familiar in that it is centered on dynamic cost-objects, as opposed to a predefined set of items that define value at a certain point in time. Recognizing and being able to adapt and leverage the inevitability of change as a strategic advantage, is one of the key benefits of the relationship-based model. This is because the relationship-based model proactively channels stakeholder energies towards continuously improving the definition of the outcome and the related technical processes that ultimately generates the deliverables. In this regard, it is a dynamic and continuous process for planning, implementing, measuring, learning and problem solving. 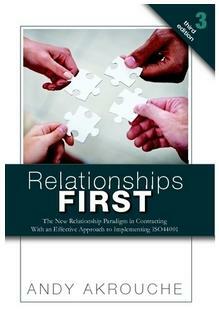 It is also from within this type of framework, that high performing relationships ultimately grow. Empowerment – Introducing joint integrated management structures and processes to gain needed insight to manage risk and for managing the relationship at the strategic, tactical and operational levels. Understanding these elements, it becomes clear that high performing relationships are all about creating high performing teams. As the inexhaustible number of case studies and reference materials over the years have demonstrated, no amount of contractual structuring based upon a traditional procurement process can accomplish this objective. Success with this new paradigm rests in our ability to change our familiar yet ineffective approach to sourcing and managing relationships. This includes focusing on ways to create a culture of organizational trust and collaboration, particularly within the public sector. Specifically, the need to see contracts beyond a “one off” deal or transaction based upon a specified need at a single, static point in time. This of course requires a cultural change within an organization in which stakeholder teams as I call them, share a common purpose that are driven by an ongoing alignment of capabilities. Towards this end, there is a need to redefine the organization’s internal vendor management and contract compliance protocols, as well as risk management oversight, before a true transformation to a high performing relationship model can occur. In short you have to stop managing vendors and start managing relationships based upon a culture of collaboration and trust. Editor’s Note: Interesting post on Andy Akrouche’s Relational Contracting Intelligence Blog – especially in relation to my interview on Thursday with Kate Vitasek. Are we on the verge of redefining the meaning of relationship in complex contracting?